We LOVE fries in The Team TLC Casa. However, I don’t love the frozen version in the grocery store. They have so many added ingredients. The frozen fries with the least amount of ingredients I have found are at Trader Joe’s. They only have about two or three ingredients but sugar is one of them. I’ll have our fries without sugar, thank you! Here’s how I make the perfect home made fries for us. This also works with sweet potatoes … which are simply delicious!! In addition, I have made carrot fries using this recipe! Sunflower Seed Oil – I use Trader Joe’s brand Sunflower Seed Oil. I’ve also used Cumin and Onion Powder. Have fun with this. Get creative and make a different flavor every time! Preheat oven to 425˚. 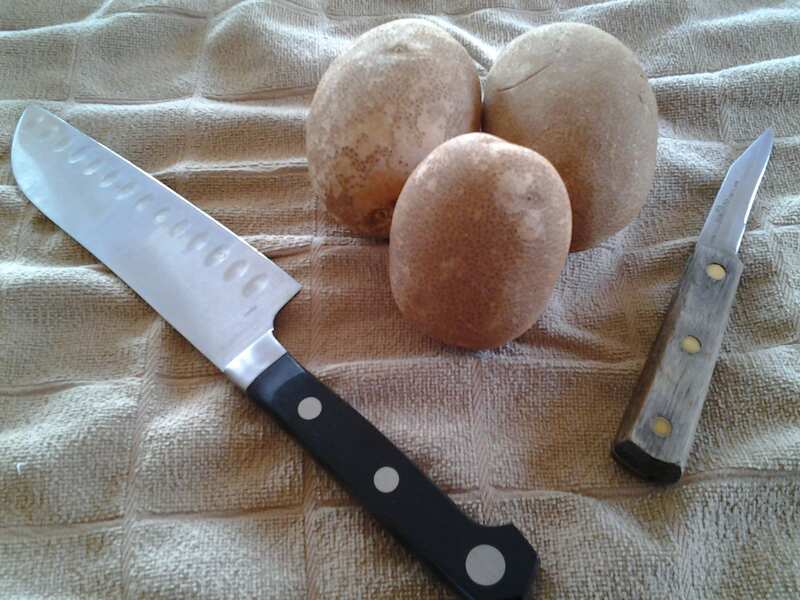 Use a small knife like the one pictured above to peel the potatoes. Next use a BIG knife to slice the potato into whatever size french fries your family likes. We like skinny. There are two reasons I prefer to do this the old-fashioned way instead of using fancy gadgets. I like simplicity and I don’t want those gadgets cluttering my cabinets and drawers and I like that not all the fries are the same size. I like fries more on the crisp side, Lillian likes them more on the soft side and Thomas doesn’t really care! This covers all three of us! 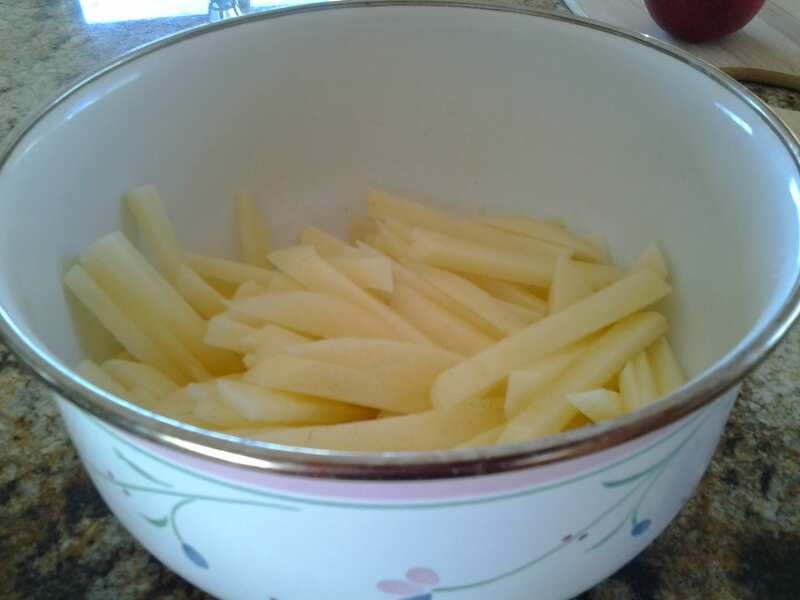 As you are slicing add the fries to a medium bowl filled with cold water. 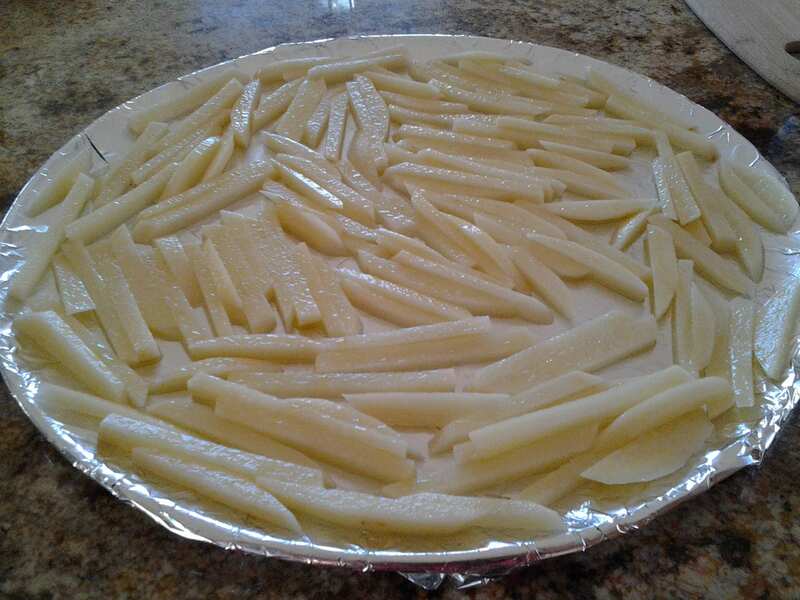 Allow the fries to rest in the water until you are ready to cook them. When you are ready to prep them, lay out an absorbent dish towel. 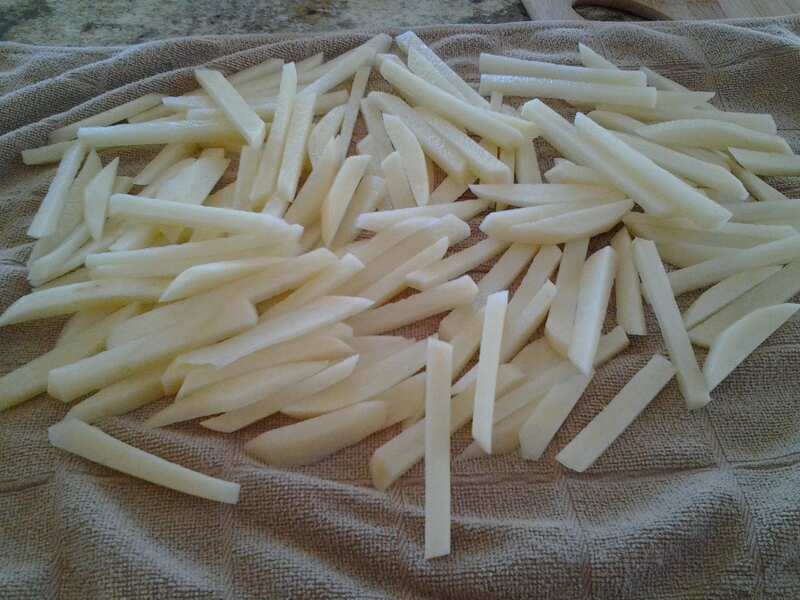 Rinse the fries good and then pour them onto the towel to remove excess moisture. Use a paper towel or clean dish towel to dry the potato slices and the bowl. Pour them back into the bowl. Add a drizzle or glug of olive oil, some shakes of salt and whatever other spice you are using and mix well. Add a drizzle or glug of sunflower seed oil and shake of salt and mix again. I like to use coconut oil too. I mix it up. Next, I spread aluminum foil over a big pizza pan and spray with either Olive Oil or Coconut Pan Spray. I’ve not tried this without the aluminum foil so don’t know if they would stick to a pan without it. Then pour the fries onto the pan and spread them apart. Place in the oven and set a timer for 20 minutes. Check the fries at that time and I also add a little more salt at this time. Keep checking them every 5 minutes after this until done to your families liking. Should be another 10-15 minutes. Thomas LOVES dipping his in Trader Joe’s Organic Ketchup (amazon affiliate link) … I love this ketchup too. It does have sugar but we don’t use much so it doesn’t add much sugar to our meals. Thomas likes it on his sandwiches too!!! Now! Enjoy those yummy taters y’all! This article is now part of my inventory in Recipes. I enjoy taking the time to share information with y’all that I think is helpful and will help you enjoy Mindful Living. So, if you feel this helped you in any way, toss a tip into the tip bowl on the way out of Recipes. 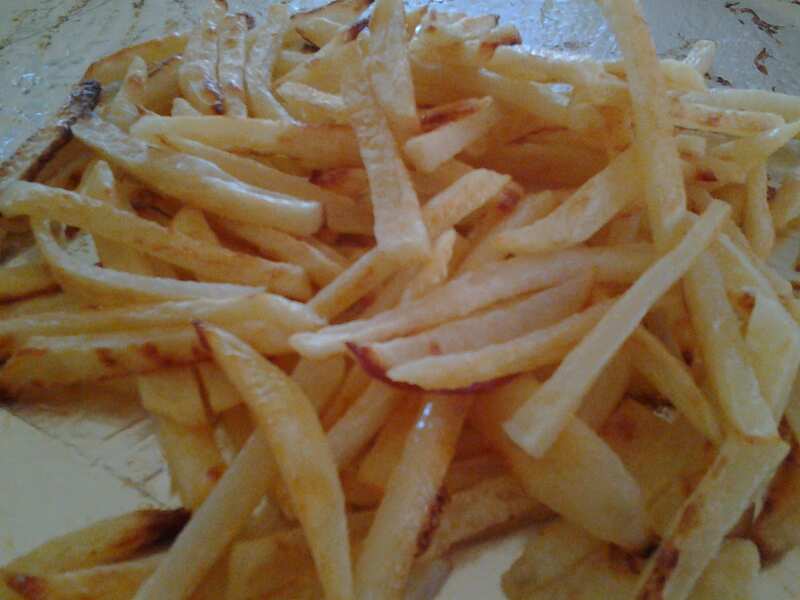 This entry was posted in Recipes and tagged baked carrots, baked french fries, baked fries, baked fries homemade, carrot fries, easy vegetarian recipes, french fries, french fries baked, french fries homemade, french fries recipe, french fry recipe, french fry seasoning, gluten free foods, gluten free recipes, healthy home cooking, healthy recipes, healthy vegetarian recipes, homemade home fries, homemade oven fries, homemade potato fries, homemade sweet potato fries, make homemade fries, potato fries, sweet potato fries, vegetarian food, vegetarian recipe by Camilla. Bookmark the permalink.